Our innovative menus contain a wide array of offerings and themes to help you create a truly unique experience for your guests for events ranging from casual to black-tie. We can also customize our menus to meet your needs. Seaport Catering hand-picks the freshest ingredients New England has to offer every day, and works diligently to find the finest local purveyors available to ensure your events are talked about for many years to come. Looking to reserve a table for a smaller group of eight (or less)? Check out our Community Food & Beverage page for more information. Customize a combination of passed hors d’oeuvres, hot and cold displays, and desserts for your upcoming cocktail reception. Complete your menu with signature cocktails from our Beverage menu! 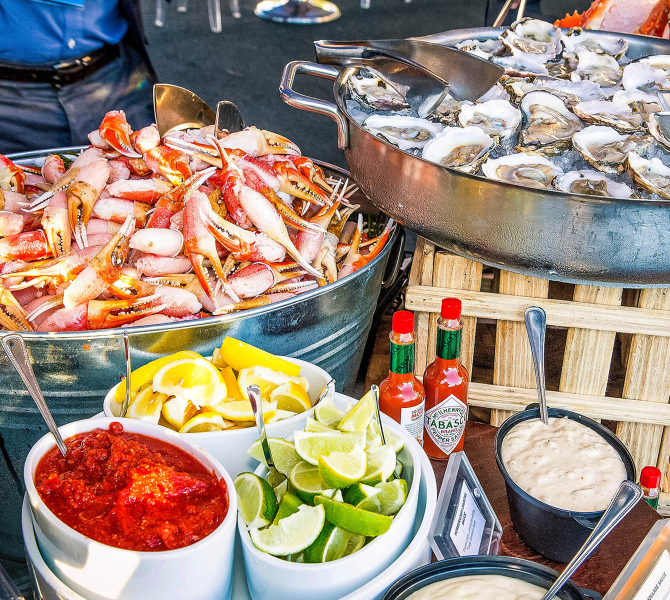 Ranging from a casual summer cookout to an upscale dinner buffet, our Signature Dining menu offers barbecue options, Surf-n-Turf, New England Clam Bake, and everything in between. We also offer a special Kids menu and A La Carte Concessions!